I read a post somewhere around mid-October that really resonated with me and I knew I needed to write my own version. In it, Raymanda, AKA BritishMumUSA describes her "happy place." Her words really put together a picture of what her happy place looks, smells, sounds, and feels like. Heck! She mentioned her coffee, so I guess you can even tell what her happy place tastes like! Please check out the original version and read ahead for my happy place. My happy place is the corner of the couch. I can stretch out under a blanket with the back and side supporting me as the kids climb up to snuggle. They might watch TV while I read or we might read a book together. It doesn't really matter what time of year it is, but I'll be under a blanket. I just like the weight of it on my lap and the fuzziness of the fleece. If I'm really lucky, I can have my feet stretched out onto Ken's lap. My happy place is waking the kids up on a Saturday morning when we have no where to go. I climb into bed with one or another and whisper sweet nothings until I hear the grunt that tells me to stop squishing them. It's rare that I actually awaken my kids in a good mood, but if I time it correctly, I can go in and get them out of bed before they've gotten cranky for the day. My happy place is sitting in a church pew next to my best friend Julie. Her kids and my kids are mingled together on the pew, on a lap, on the floor. I see Ken holding a child that isn't his, but whom he loves anyway. I see two boys sharing colored pencils while coloring art work about today's Gospel. I lose track of my son and find him again tucked securely under the arm of his brother's godfather. I have a child who isn't mine tell me she needs to go to the bathroom and I send her off with a child who is mine for supervision. I hold my hands out for the Lord's Prayer and never know who will grab on to them or how long they will stay still once they do. I smile at the woman behind us who thinks Julie and I are sisters and that Steve and Carrie are our parents. My happy place is the living room upstairs at my parents' house. The kids are in bed and I smile that Frances thinks my room is her room. That's what her grandmother has told her anyway. She knows it used to be mine, but it isn't any longer. And my boys are sleeping in what was previously my little brother's room. And my mom and I chat and watch TV while we take turns shooing kids back into bed because at Grandma's house the rules are pretty loose; even if mom is around. And that's the way it should be. My happy place is driving down the interstate with the music blaring and the kids singing, or laughing, or fighting, or sleeping. We're headed for a trade-off or a visit. They know somehow during this trip they'll get to see loved ones. Maybe if we're extra lucky we'll get to spend some extended time with them, but whether it's a hug and trade trip or a full blown visit, it's nice to love on people you don't get to see often. My happy place is outside on a warm summer night. It's quiet except for the crickets and maybe the crackle of a fire. You can see the stars and count them if you're so inclined. You confuse a few of the fireflies for them. The grass is soft, the lemonade is tart, and the company is good. My happy place in laying in bed next to Ken at night. The house is more quiet than usual. He's almost asleep as I ask the stupid, hypothetical question. I can feel him roll his eyes at me and I giggle. He and I both know he's not a fan of conversation, but it's easier when the lights are out and the question is light. He also knows that the best way to shut me up is a snuggle. Which may or may not be why I asked that dumb question in the first place. What about your happy place? Where is it? How do you get there and how often do you get to visit? I have several of my happy places, some of them including Saturday nights on the couch watching the movies with kids or just-before-I-pass-out-snuggle time with Frank. The poor man swears up and down I've mistaken him for sleeping pills. We had our last soccer games of the season on Saturday. I love watching them play, but I'm not sorry to get my lazy Saturdays back! I do the same to Ken. I'll propose that we watch a movie and he gives me "the look" and says "Are you sure???" More often than not I fall asleep and he just pauses it so we can catch up later. Yeah! Happy thoughts are a great way to start a Monday morning! I like your happy places. I love my couch too. Hahaha, we just the family snuggle with the 17 year old and she did not burst into flames!!!! IT's a miracle! Love that your church is so welcoming, I can feel it's warmth. This post makes me happy - you have some really great happy places!!! You have good happy places! Isn't it interesting how as we get older, not old, just older that our happy places are so simple. I'm pretty sure there's a dent the exact size/shape of my rear end on that couch, but that's just 'cause I love it so much! Thanks Kim! Glad to hear I'm spreading happy around! 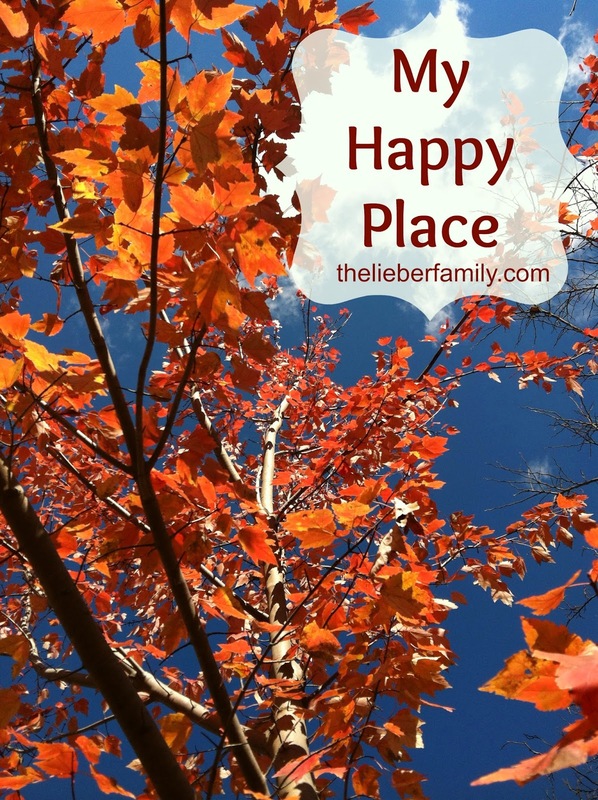 Many good happy places! I have a few like standing under a palm tree feel the warm breeze against my skin. Or cuddling up with my furry kids and the Mr watching a movie. So many reasons to be thankful to be alive. :) Have a great evening. So many little things that combine to make life great, aren't there? Thanks for your well wishes. Have a wonderful evening.